Currently, so many countries are suffering from global recession. Lot of youths are unemployed. In such situation, Stock market becomes apple of pie for everyone for their bread and butter. There is lot of variation occur in the price of shares. Every trader usually track statistic and news related to share market. On that basis, they decide which share they should buy or sale. But, lot of times the share price guessing of new traders fails and they lose their money. To provide solutions and guideline to new as well as experience traders, we have proposed stock price prediction system machine learning project. It will help trader to predict the downfall and rise up curves of share prices. 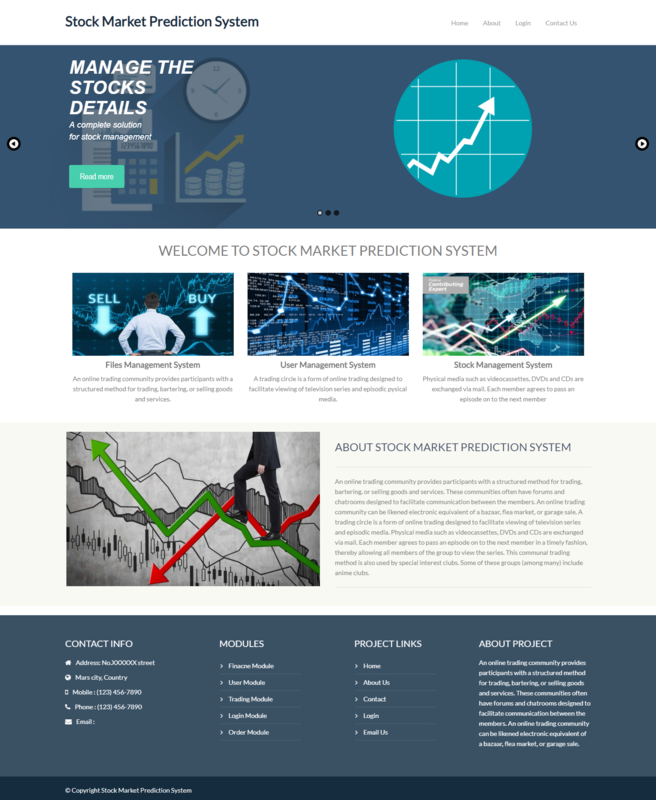 Stock price prediction system machine learning project module is smart machine learning technology based system that is used to analyze the share statistics and do data analytics on that data .As per obtained and gathered data, this system put up prediction using several stocks and share market related predictive algorithms in front of traders. This will help traders to take their buying and selling decisions regarding shares. The accuracy of this share price prediction system is more than 90% now days. Lot of brokerage houses start using this kind of machine learning based system to give the calls related to share market to their clients. Stock market is really very sensitive and it is quit critical for anyone to predict about share prices in the next moment so, to get accuracy in decision making, every trader should use this type of system. The algorithms of share markets are failed due to some news related to company or government dealing etc. The accuracy of our proposed system gets violated only due to such kind of news so; traders should follow business related news. The statements of company CEO’s, founders and some authorized persons will affect share prices of that company. When some ministers proposed some scheme related to that company industry, it will also affect share prices. If anyone interested to do more research on this topic, you can carry forward your research towards increasing accuracy of our currency system. You can use artificial intelligence tools to modify the current system and can improve its performance. You can interface your system with internet. When someone uploads any news related to company or related industry, your tool recognize it and process that news and find out hidden emotions and positive or negative impacts of that news on company shares and as per that your system can modify its share price results.